Like all Koreans, I love all kinds of ddeokbokki. There are all sorts of ddeokbokki (it’s like kimchi) – the spicy kind, the non-spicy kind, regional versions and versions based on the added ingredients (like adding bean sprouts or other vegetables). 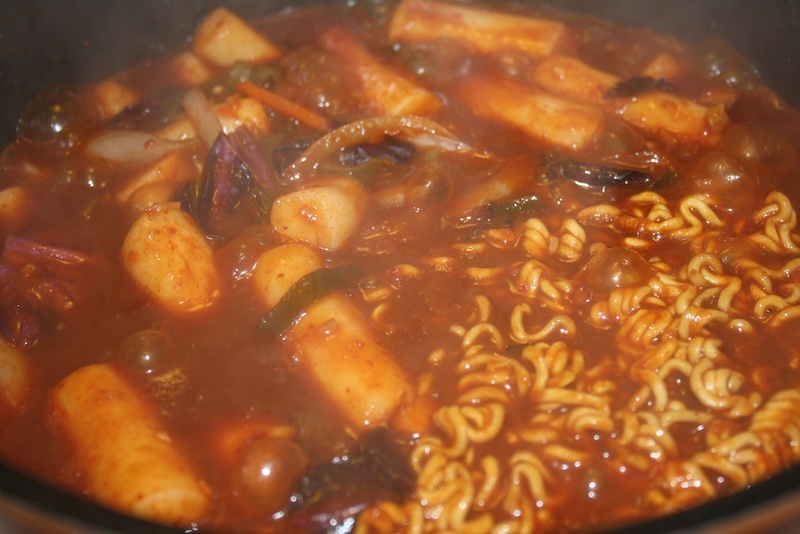 One kind of ddeokbokki that is very popular among Seoulites in particular is Shindangdong ddeokbokki. This neighborhood called Shindangdong in Seoul is very famous among for only having ddeokbokki restaurants. They literally have hundreds and hundreds of ddeokbokki shops lined up for miles, and Seoulites go there during the day and also all night to enjoy the Shindangdong style ddeokbokki. Shindangdong ddeokbokki is unique, due to the black bean paste they include in the pepper paste. I was really craving Shindangdong ddeokbokki the other night, so I made some with the black bean paste, and Bill said this was his favorite ddeokbokki I’ve ever made for him! Next time we visit Seoul, we will be visiting the Shindangdong ddeokbokki street for sure. add some Thai pepper (fresh or powder) if you want it really spicy like us (optional)! 1. Prepare your kombu broth several hours earlier (or the night before). 3. Add all the sauce ingredients together and put it on low heat. Let it simmer for several minutes but don’t let it stick – you need to add water every time it gets too dry. Check and see if the sauce tastes good to you, and add some more ingredients accordingly to your liking! 3. Add all the main ingredients into the pot. Add kombu broth to the pot so it covers the ingredients. 4. Bring to a boil and reduce heat to low-medium and let it simmer for 5 minutes or so until the rice cake is semi-soft. 5. Add the Korean ramen noodles (add some hot water on top of it if there is not enough water for the noodles to soak up). 6. Wait only until the noodles get semi-soft (you really don’t want the noodles mushy, it doesn’t taste good! ), check the rice cake to see if it is done. Rice cake textures differ out of the bag, so you need to make sure that your rice cake has become very tender before you eat it. 7. Sprinkle some sesame seeds on top and enjoy! 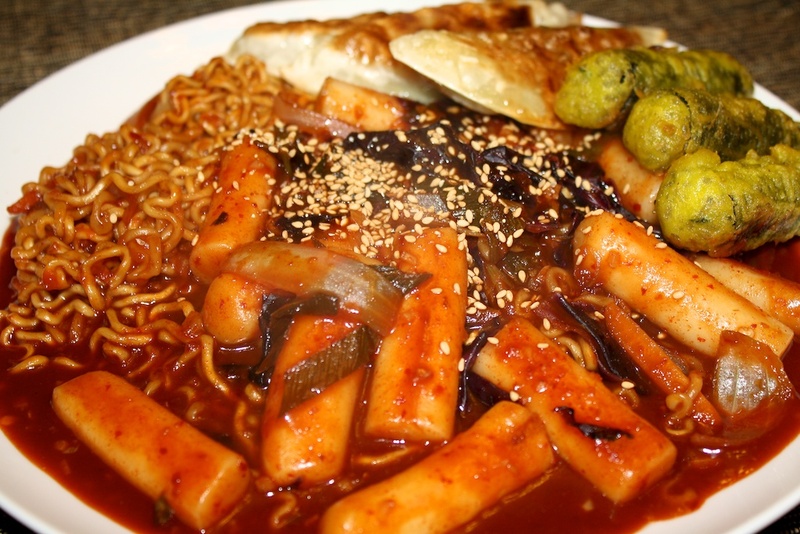 Yumm… ddeokbokki takes me back to Shindangdong in Seoul, instantly! 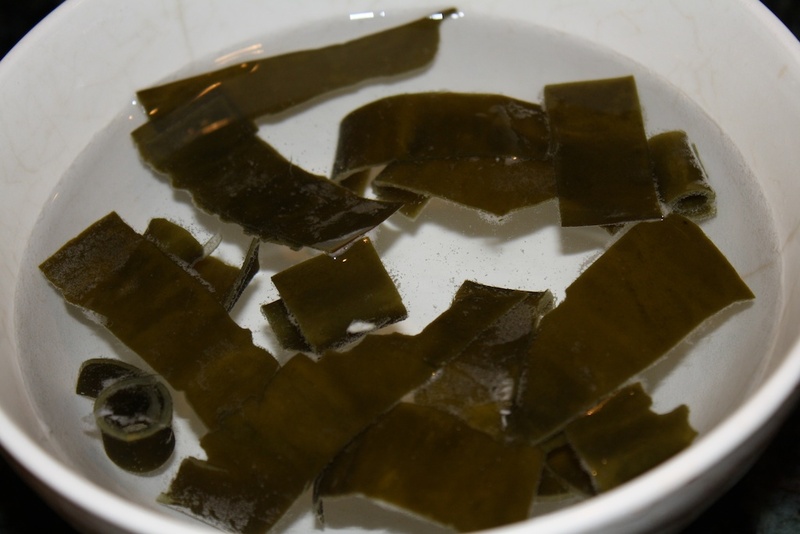 Soaking kombu in water the night before – remove the kombu when using broth! Before you start preparing anything, you want to start soaking your rice cake in warm water so it will be ready to add later. 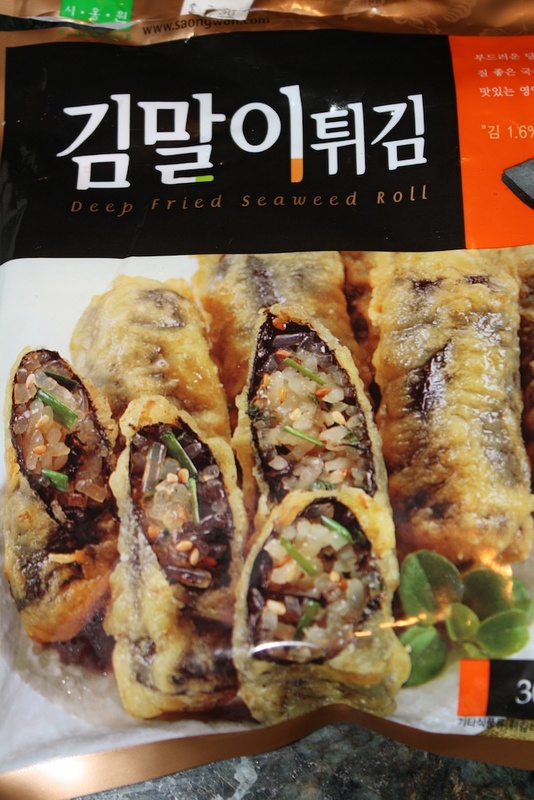 These are kim-mari, they are deep fried seaweed rolls ( sweet potato noodles and some veggies are inside the seaweed wraps). Bill and I love them. So yummy! These are called Ramen-Sari. They are ramen noodles without the seasoning. They are cheaper than normal, and you will be able to find them in a Korean store. Some stores might not have them, in that case, you can use normal ramen noodles – but you’ll have to waste your seasoning pack! 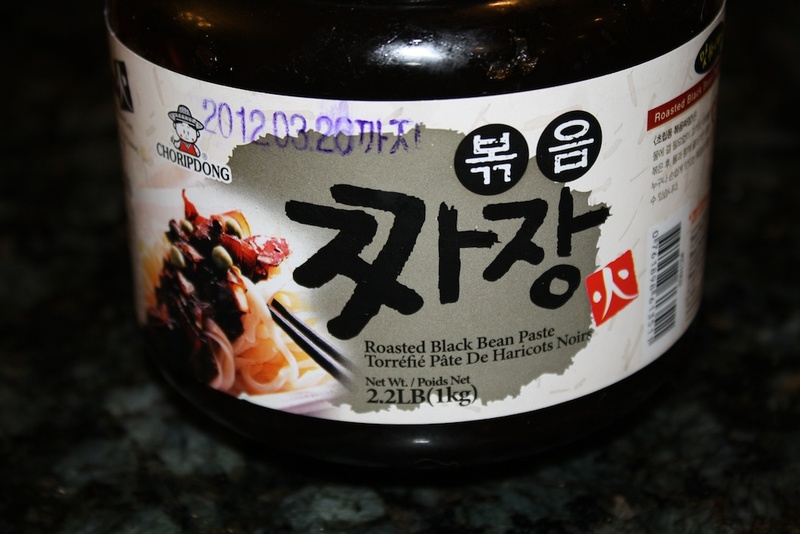 The black bean paste that we used for the dish – vegan and MSG free! 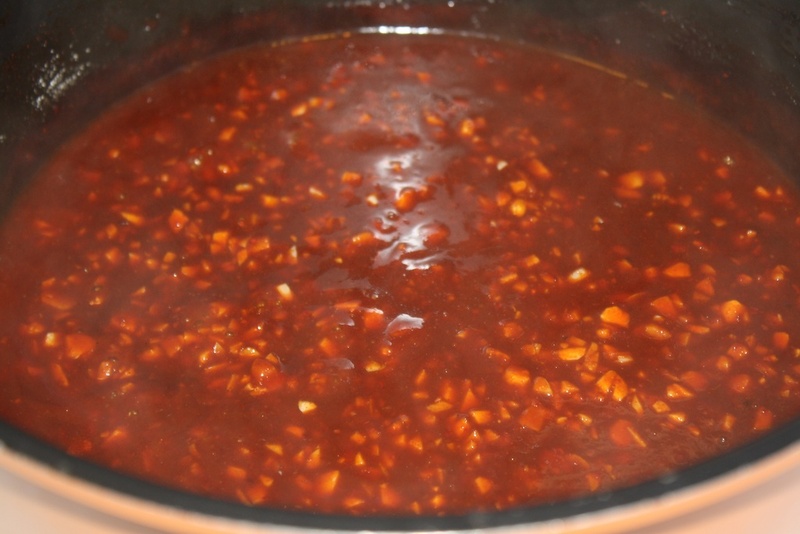 Making the sauce – let it simmer for several minutes but don’t let it stick – you need to add water every time it gets too dry! 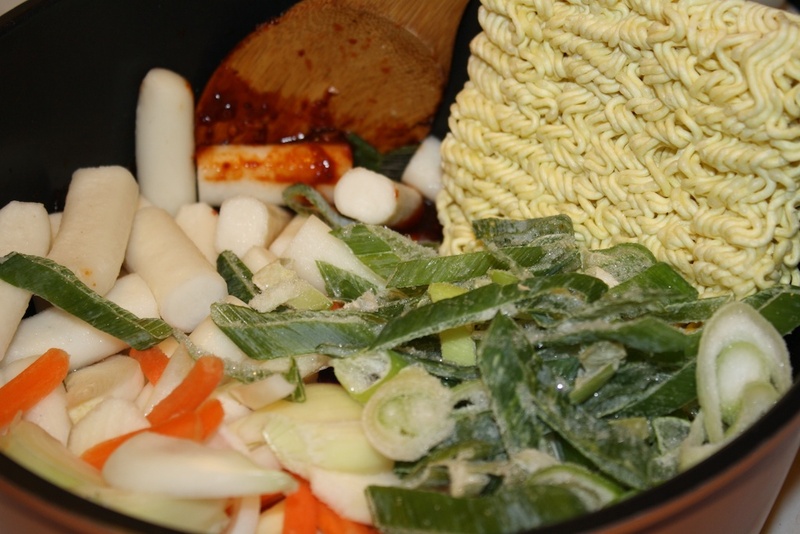 Add all the main ingredients into the pot (except the noodles which you’ll want to add a bit later) and add kombu broth to the pot so it covers the ingredients! Bring to a boil and reduce heat to low-medium and let it simmer for 5 minutes or so until the rice cake is semi-soft! Add the Korean ramen noodles and don’t forget to add some hot water on top of it if there is not enough water for the noodles to soak up! Have your fried dumplings and kim-mari ready to eat with the ddeokbokki! You dip the dumplings into the ddeokbokki sauce when you eat them! Sprinkle some sesame seeds on top! 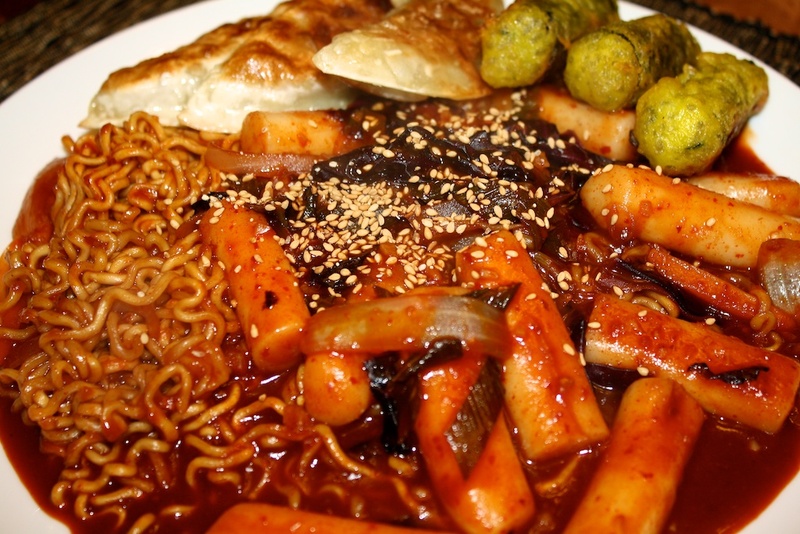 And yumm… enjoy ddeokbokki – Shindangdong style! ← The Amazing Gugija-cha (Korean Roasted Goji-berry Tea)! This is a fantastic post! I remember eating this but not knowing what it was called. Excellent!! 😉 I hope you enjoy Kim mari, Lu. I have always loved it and Bill likes it too. Hope all is well!! Mari. Hope you get to try it with ddeukbokki next time. Hope all is well! i’ve been meaning to ask, do you have a good vegan haejangguk recipe? and do you feel like it is really refreshing if youre hungover? i need some good recipes in my ‘hangover food’ repertoire and ever since i caught wind of koreas beloved ‘hangover soup’ ive been so intrigued!! OMG! That’s one thing I miss about Korea. The dukboki dish has so many variations, with the ramen noodles added being one of my favorites! Haha… Yes…. 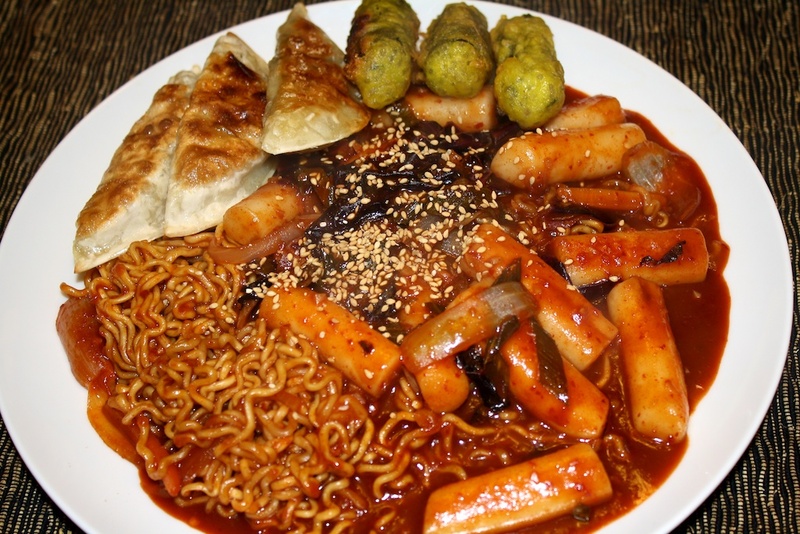 Ramen noodles in ddeokbokki is one of my very favorites snack foods too! 😉 Hope you enjoy!! I love your vegan Korean recipes so much! Thank you for them and please keep posting them! I make ddeokbokki so frequently, but I love this version and can’t wait to try it! I don’t really like the tube shape rice cake. The texture is what I don’t like about it. However, thank you so much for introducing me to Kim-Mari. Wow, I just bought it and tried it. Love it! I ate with the red pepper sauce. I also like Mandu and ramen. This is a great recipe and I love all of it except the rice cake. Ah, yes… some people just find rice cake a little too chewy. But so glad to hear that you liked Kim mari!! It is one of our favorites. 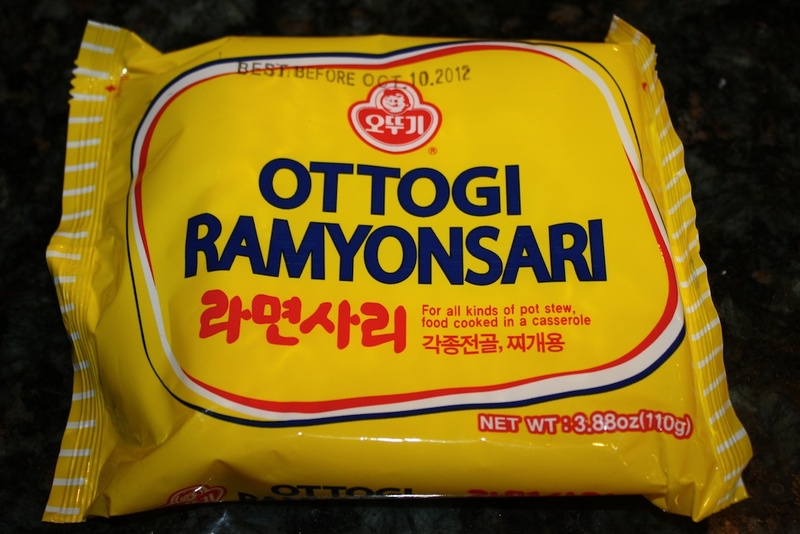 😉 You can still make the sauce in this recipe and have it with ramen, Kim mari and mandu as well, so maybe you can give it a try on the future!! Hi Sunnie, thanks so much for the recipe. I love ddebokki but never tried this version before. After I found your blog the other day I straight away tried making it myself. It turned out great. I’ll sure keep this version in the future if I’m making it again. Thanks for sharing. Would it be okay if I post it on my blog ? Thank you so much for this recipe! I’m moving to Korea in a few months time and have been keen to try some of the cuisine before I left, but in the UK Korean food isn’t easy to come by, especially as a vegan. This was absolutely delicious, and very easy to make. Just made this dish for my half Korean husband and he approves 🙂 didn’t use the dumplings or those Kim Mari but it still turned out fantastic. I am so happy that we found a Korean vegan blog I already made 3 recipes I two days. The japchae recipe on here is amazing! This looks really great!! I’m definitely going to try making this. Do you know how many calories would be in this in general? Is it not really considered a healthy dish? Thanks in advance! Hi, Rebecca. I wouldn’t say it’s the healthiest recipe on the blog, but it’s not bad, particularly if you increase the amount of veggies. Ddeok is rice, after all…. As for calories, I really have no idea, sorry! Thanks for visiting, and I hope you enjoy! Hi, Alexa – just regular cabbage! Also, I’m planning on making this for my friend who is from Seoul. How long does it usually take to make? Should I make the mandu a day before? It shouldn’t take too long. 30 minutes or so – until the cabbage is tender and sauce is thick. You could make the mandu a couple of hours ahead of time. It doesn’t have to be hot – only lukewarm! I can only find the oval rice cakes at my Asian grocery store. Can I use those? Whoa! This was a huge hit at our house! I plunked the pot on the table and we all dug in. I wasn’t really willing to lift my head (out of my bowl) high enough to watch my husband’s reaction, but it was dead silent. I said, “You’re not saying anything over there. How is it?” His reply was, “I’m not saying anything because it’s so d&mn good, I’m busy eating.” Thanks Sunnie! I finally tried this recipe. It becomes more like noodle soup, a spicy noodle soup. The broth/sauce didn’t appear to be thick and gravy like in the pictures in your blog. Maybe I put too much kombu broth? It was good tasting dough. I could not find Ramyonsari with that brand but found other instant noodle with no spice packages. However, I found the other stuff like the Roasted Black Bean sauce. Yummy! 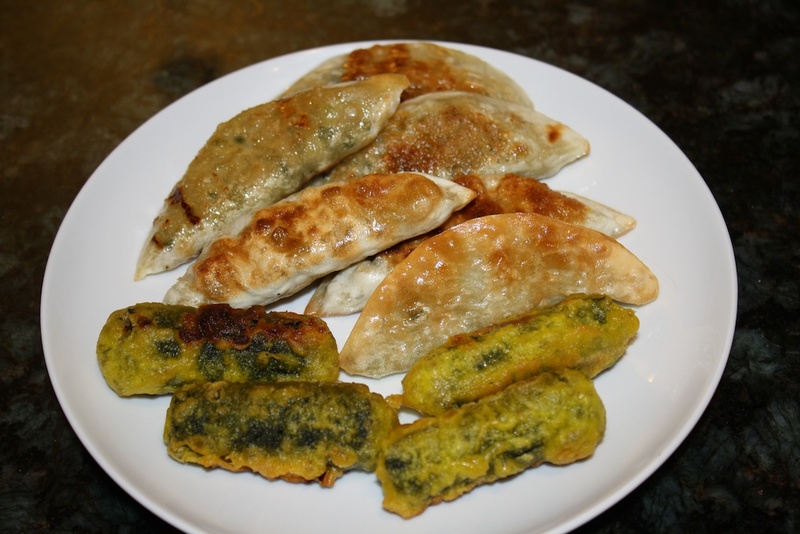 We love the Kimari and Mandu (I bought Yachae Mandu which appears to be vegetarian). Husband loves the mandu. 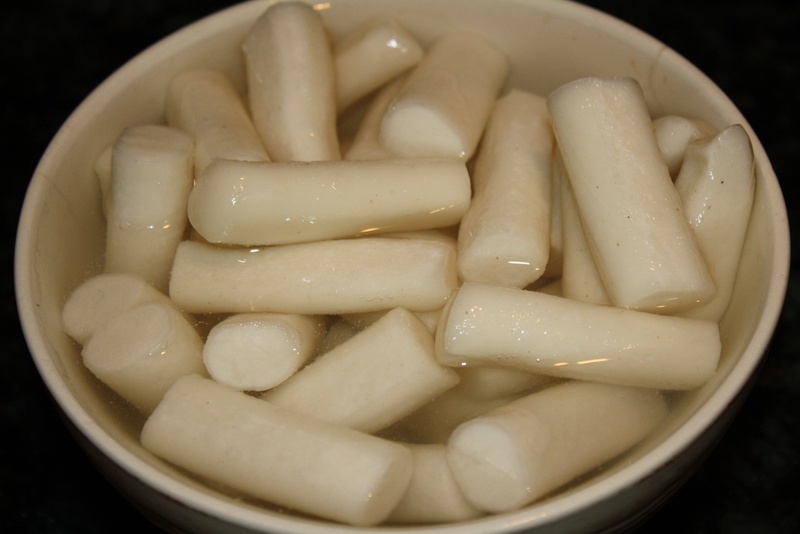 We both love the dish, sauce, kimari, noodle, and mandu but not to fond of the rice cake sticks. LOVE your site. Thank you! I was so lucky to find this. We have a big Korean population here in central NJ, but not many vegan or vegetarian options. I usually get Gob dol bab without meat. I made ddeokbokki for Rosh Hashanah. SO. GOOD. What a great way to start off the new year! Haha! What says Rosh Hashanah like ddeokbokki? That’s what I’m sayin! 🙂 So glad you enjoyed it! I have been craving Shindangdong style ddeokbokki since we got back from our Seoul vacation a couple months ago (we made a special trip to ddeokbokki alley while we were there!) and I am SO glad to have found this recipe! I can’t wait to try it out!! That’s great, Cassie! We are finally planning on another trip to Seoul later this year and really looking forward to it! Hope you enjoy the recipe! This recipe is GREAT! I was just wondering, because it is so hard to find vegan Mandu in Korea, can you tell me some brands please? THANKS! Hi, June! Glad you liked it! Actually, we were just in Korea and couldn’t find any! Even the same brands we get in the US were not vegan in Korea. Sorry! Let us know if you find any! And also, does ramen not contain egg? I don’t think ramen is vegan? Also, doesn’t the kimari have egg batter on the outside? This looks like fun to make but I’m a bit confused since there is no portion amount for the kombu broth or rice cakes. I dont really know how many to use! Hi Kate- just add 4 or 5 2×3 inch slices of kombu to the described amount of water and the rice cakes should 4-5 cups as described in the recipe! I too am not fond of the texture of rice cakes so I substitute tubular pasta for the cakes. Boil the pasta and add at the same time as the ramen noodles. I know I really can’t call it ddoekbokki anymore but it works for me. Hello, if you can’t find sea plants to make the broth, you could probably just go with water or veggie broth. Hope it turns out well for you! Hi there! I recently moved to Indianapolis and wanted to know a good asian store to get these ingredients from? So sorry! Just saw your comment. Saraga on 38th Street is probably the biggest but there are multiple others in Castleton and elsewhere that would have everything you need. Brothers out on Pendleton Pike is probably the biggest Korean focused in town.